You are here: Home / About Sports Performance Anxiety / What is Choking in Sports? What Are The Causes of Choking in Competition? What does it really mean to choke in sports? It’s often a dirty five letter word for athletes. Something they never want to experience. The term “choke” comes from the concept that you feel like you can’t breath – or someone is strangling you – when under pressure; a lack of oxygen. But choking has a wider meaning to me. Choking happens when you get in your own way mentally or your mind prevents you from performing at your best. In most cases, athletes experience physical changes, such as tension, increased heart rate, and rapid breathing. Athletes also report mental changes, such as anxiety, apprehension, and confusion. Athletes often change their strategy when choking and often perform more tentatively. Most athletes and coaches would agree that choking happens when you are firmly in command of your performance or the competition and you lose because of a change in your mental state, which learns to a mental meltdown of sorts. 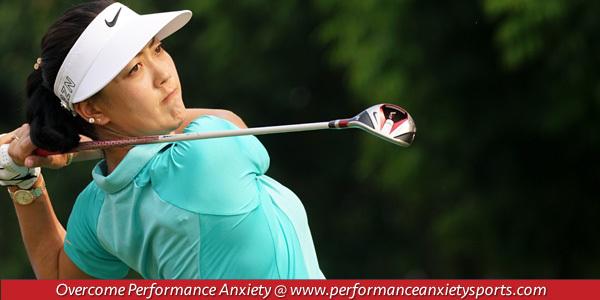 You feel pressure or suddenly lose confidence, such as when Rory McIlroy lost a big lead and shot a 43 on the back nine during the final round of the 2011 Masters tournament. Athletes who choke will lose a big lead because they are fearful of not finishing off the game or they perform tentatively or defensively and lose trust in their skills. At the Masters, Rory McIlroy had one of the worst days of his life. He shot a final round 80 at the Masters and blew a six-stroke final round lead. Two month later at the US Open McIlroy blows away the field and wins in record fashion. Many golfers would have nightmares after experiencing a final round meltdown and most likely be super hard on themselves. Instead, McIlroy turned it into a character-building experience, which is a great lesson in reframming a negative experience into a learning opportunity. “You know, it’s going to be hard to take for a few days, but I’ll get over it. I’m fine…. This is my first experience at it, and hopefully the next time I’m in this position, I’ll be able to handle it a little better. I didn’t handle it particularly well today obviously, but it was a character-building day, put it that way. I’ll come out stronger for it,” McIlroy said after the meltdown on Sunday. But I think athletes can also choke at the start of the competition. They might feel intimidated or have a lot of doubt interrupting their mental processes. They proceed to play scared or afraid to lose and thus can’t perform with trust in their skills. So we know that choking often happens when you are in command of your performance and maybe winning or in the lead of a match. We also know what a drastic change in your mind, due to pressure and performance anxiety cause you to start change your motor patterns. Most often, athletes perform more defensively and afraid to let the win slip away.